You are such a fabulous Pastry Chef! These look amazing. So glad you shared another of your wonderful recipes and expertise! Dare I admit, I'm not the world's biggest fan of mince pies? Unless I've been for a three mile walk in chilly weather, that is. Pauline, it's okay :D but here's what to do then. First, make the mincemeat. Then make half the pies with the mincemeat just as it is. And half that are half mincemeat/half finely diced apple. I think even my husband will love them done with half extra apple! wow Jean, I am drooling...I must make the mincemeat too. Thanks, Angie! Glad you're a mincemeat fan, too. Don't mince pies go beautifully with a nice cup of tea? Jean, your little mince pies look amazing! 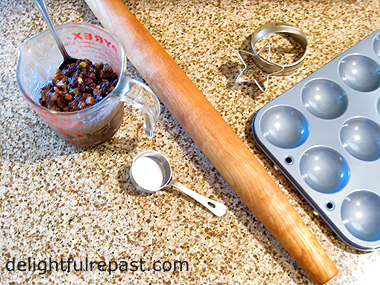 I have never made my own mincemeat but my parents did. I will definitely try your recipe when I make my own. I make my own pie crust unless I'm in a rush and then I cheat and use the frozen mini tart shells. I know, it's never as good. But I have to agree with you, mincemeat pies are such a treat with a cup of tea! Thanks for sharing. Am calling back all my information-gathering operatives that I’ve had out in the field since childhood trying to discover what the meat is in mincemeat. Suet. Puh. What a bummer. Thought it would at least be something exotic like hummingbird tongues or desiccated walrus bladder, but…suet. Suet, suet, suet! (Why are pigs running at me?) Sigh. Biggest disappointment I’ve had since I found out artichoke hearts don’t pump blood. Note: put Delia in the cupboard for three years or until she recants, whichever comes first. Sandi, thank you! And come back next Thursday for the pastry for the mince pies. It's easier than regular pie crust because you don't have to worry about over-mixing it and making it tough. Sully, the meat used to be beef or whatever, in addition to the suet, many years ago. The spices and dried fruits disguised the rottenness of the meat. Yum yum! Poor Delia in the cupboard! Amy, I so agree with that! This week, the mincemeat. Next week, the pastry and the baking. I remember mother baking these and how good they made the house smell! Mildred, thank you for sharing a food memory! I always think of my mother when I make them. Mmm, more crust per bite this way. What a cute tin that is, and I would imagine these pies are a huge hit. My grandma made the most marvelous real mincemeat with meat, raisins, apple, I think, and probably suet. Of course there were other ingredients, including the wonderful spices. Even as a kid I loved that stuff. What a fun memory this has dredged up, Jean! Thanks. Mmm, yes, Judy, we do like our crust, don't we?! I'm sure the meat your grandma put in her mincemeat wasn't rotten as in the (really) old days! Great ingredients in that receipe..
Dom, thank you so much! I love keeping my British heritage alive in the kitchen. Thanks, Tandy. I think the vanilla really adds something. It doesn't get lost in the brandy. Thanks, Margaret. I love all those flavors. Sounds like a lot of spice, but once the mincemeat is combined with the crust, it's really just the right amount. This is so funny jean, I was just talking to my daughter about mince pies, and how we really wanted to try them this year. They've always mystified me, but your recipe looks so inviting, and all those lovely spices are calling my name! Sue, thanks! I'll be posting the pastry and detailed directions next Thursday. You will no longer be mystified! :D I hope you and your daughter will make this the year of the mince pie in your family! Greg, it would be interesting to discover a psychological block, for your own purposes, but it's really okay to not like mincemeat and fruitcake! :D Seems to be a common "problem," in America anyway. So whenever I serve either, I make sure to serve something a bit more universal in appeal as well. Ooh Jean, I would love to try one of your mincemeat tarts! They are so adorable and I look forward to your pie crust recipe next week. Thanks, Kitty! I love making little pastries for my afternoon teas. One does go for "adorable" on such occasions! Mince pies really are popular over here this time of year - and good mincemeat is definitely the foundation of a good mince pie! Your mincemeat recipe sounds delicious, Jean. And I agree, it's so important to use organic fruit when the peel is going in the recipe as well. I use it mincemeat in so many things - including squares and cakes - I look forward to giving your recipe a try! Sharing! Thank you for being a part of the Hearth and Soul Hop. April, thank you! And thank you for sharing my post -- much appreciated! Your blog post was one of featured posts from Monday for today! Congratulations! Bernideen, thank you so much! And I hope all my readers who love tea and teatime treats will check out blog.bernideens.com. I think your recipe to be wonderful, I love making little pastries, and these are in the theme with British traditions, which also I love so much ! I'm taking note, it sound too inviting, believe me! Dany, thank you! I hope you'll make them soon and let me know how they turned out for you. 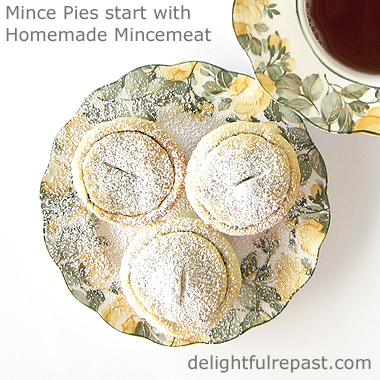 I love mincemeat pie and have always made it with purchased filling. Thank you so much for sharing your recipe! Also thank you for leaving such a sweet comment on my post! Thanks, Nancy! I make tiny pasties for afternoon tea, too tiny to feed the miners in the UP! Oh my . . .I might have to do this. I like little mince tarts, but never have made any. Mince meat filled cookies, but always with purchased mince meat. I'll bookmark this and see if I have time next week. Thank you! Thanks, Deborah! 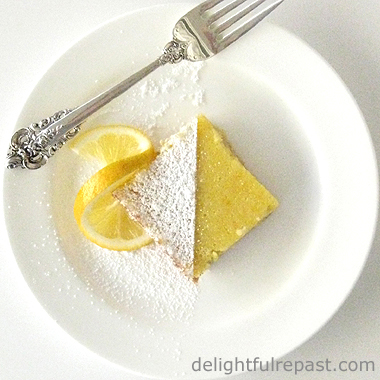 If you like storebought (and it is pretty tasty), I think you're going to love homemade! I have to try these as I have never had them! I love how you put these together; individual pies always seem extra special to me. Like many in the US, I'm not well-versed on the virtues of mincemeat, and in reading this post, I was reminded of the one thing I knew: suet as a typical ingredient. I'd likely mirror current trends as you have sans the meat. Pinned for future reference! Jenne, they're an English/British thing, so a lot of people have never had them. But I think you'd like them! Brooks, thank you. Of course, *you* would probably take the time to make lattice tops for them! Though I make those for big pies, I'm just not up to making a bunch of tiny ones. But Thursday you'll see ones about as fancy I'm going to get this time around! Jean...I just saw your post on mincemeat. My mother's family is British and we always have mince tarts for Christmas (and afternoon tea). But I've always used the store-bought mincemeat. Your recipe sounds so good I'll have to try making it from scratch! You make beautiful pie in the world, thanks for sharing this mincemeat pie for Hearth and soul blog hop, pinning and tweeting. Thank you, Wanda! I do hope you'll try it and let me know how you liked it! Swathi, you are so kind! And I so appreciate your comments, pins and tweets. Lucy, thank you! I hope you will try them soon; I'll be posting the pastry and directions on Thursday morning. I know this will sound weird but I never tasted a mincemeat pie until last year. I kept saying, "Why didn't someone tell me they were this good???" Then I began making my own. I must try your recipe next. Maureen, better late than never, I suppose! I just made another batch of pies today. They are sooo good, especially while they're warm. Your Mince Pie are going to be heavenly! Thanks so much for sharing your post with us at Full Plate Thursday and have a great day. Miz Helen, I will, thank you! Your mince pies look wonderful and I am sure your ,"mince pies," look wonderful too Jean. A little Cockney Rhyming Slang joke there amongst us Brits. The way you display your pies might refer to the Cockney slang. Was that intentional?Ha! Ha! Yes, us lot over here can't have Christmas without mince pies. Tony, how funny! And, you know what, it *might* have been intentional in a subconscious way -- I *had* just decided to start re-watching the old Good Neighbors/Good Life series and was thinking about the fake Cockney character! Will you be baking the mince pies for you lot? Thank you, Lea Ann! I do hope you will make them soon and let me know how they turned out for you. Wishing you a wonderful 2016! 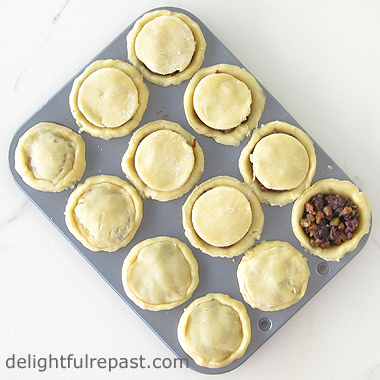 I've seen so many photo's lately for Mincemeat Pies, and they always look so perfect! Honestly, I have never known what makes "Mincemeat", so I really enjoyed this post/recipe and getting to learn what exactly it is. It really sounds delicious, and I can see why it is so popular! Thank you, Lil' Cookies! You're not alone -- the name "mincemeat" makes a lot of people wonder what sort of strange concoction it is!